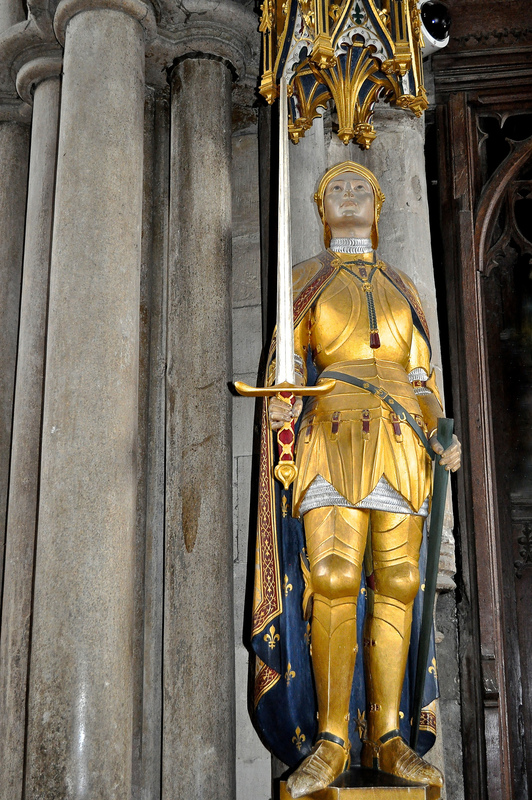 For the third in this venerable series to promote the forgotten statues of yesteryear, here we have one of my favourites – Joan of Arc of course, situated outside the Lady Chapel in Winchester Cathedral. Created by Sir Ninian Comper in 1923, the statue’s base is said to contain a piece of stone from Rouen Prison, where she was held captive for her trial. Research shows that Sir Ninian was a Scottish artist of some note – one of the last great Gothic revivalist architects in fact – best known for his ecclesiastical commissions including works for Westminster Abbey and is noted for his re-introduction of the “English altar”. Why Joan of Arc you might ask? Well, it seems that she is sited by the Chantry Chapel of Cardinal Beaufort who is said to have attended her trial and condemnation. When she was canonised in 1920, Winchester Diocese apparently wanted to make reparation so commissioned this statue.